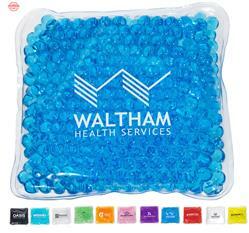 A square version of our "Original" Aqua Pearls Ice Pack and Heat Therapy. Simply microwave for warm therapy or freeze for cold therapy Double Safety Tested: CPSIA, FDA, and TRA Toxicological Risk Assessment Safety reports for Pearl beads are available upon request. Reusable and easily cleaned with mild soap and water. Available in a variety of shapes, colors and themes. 4.25" L x 4.25" W x 0.5" H. A great custom ice and heat pack! 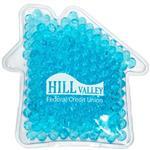 Dimensions: 4-1/4" x 4-1/4" x 1/2"
Typical Imprint Area(s): 2.75" x 1.5"